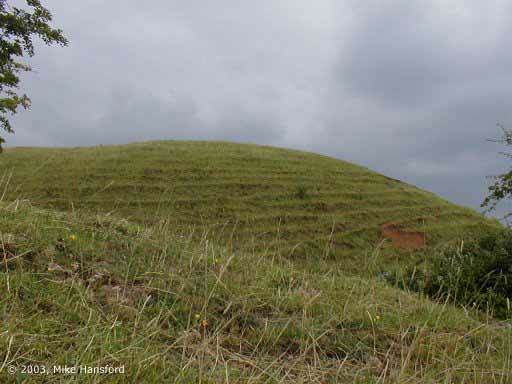 Maes Knoll Iron Age fort (ST601660) is a fort once occupied by the pre-Roman people called Celts. The Celts came here about 500 BC and were basically farmers skilled in warfare who brought with them from Europe iron working skills. The original tribe to occupy Maes Knoll and surrounding areas was the Dobunni tribe, who, it is believed built the camp around 250 B.C. before being succeeded by the Belgae around this area in about 75 B.C. 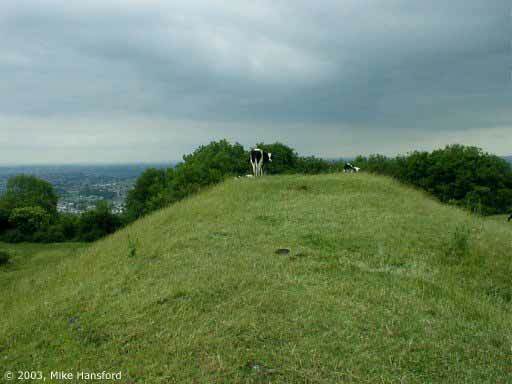 Maes Knoll is one of many hillforts that can be seen all over Britain and this one can be found on the south side of Bristol, on the eastern end of Dundry Hills. There's basically two ways to this fort. Firstly, by walking across the fields from East Dundry Lane, and secondly, from the south through Norton Lane/Maes Knoll Lane. The 'fort' can be accessed by walking, or even driving up East Dundry Lane, although driving there may be difficult for parking. It's for that reason, and other reasons, it may be better to walk up through the lane from the bottom. Three quarters way up the winding lane there is an opening into the field to the left. Walk along what appears to be the trodden path along the escarpment until you come to a gate where you can get over into the next field. From here you can see that you need to walk along the hedgerow until you come to the camp. I mentioned above that you can drive up the hill, but I feel its a risk parking there with the amount of car crime in the area, although I have parked there a few times without any problems, it is a favourite lane for burning out stolen cars. To get to the fort from the South clearly depends on where you are comimg from. As I was coming from Bristol then I shall explain it as if you are coming from that direction, although, anyone coming from the south towards Bristol will be on the A37 that passes Norton Lane/Maes Knoll Lane. Leave through Whitchurch on the A37, Wells Road, past the Maes Knoll Inn in Whitchurch Village, formerly known as the Black Lion public house. I mentioned the Black Lion public house for two reasons, firstly because it may well be better known to you if you have ever travelled on the A37 out of Bristol, and Secondly because the pub sign used to show a rampant Black lion which was the emblem of the Lyons family who held land nearby at Lyons Court, known now as Lyons Court Farm, which is one of the oldest buildings in Whitchurch dating back to the 13th century. That's the good thing about streetnames, districts and public houses etc, in that they generally give a pointer to some local history or landmark long forgotten by local people. After passing the Maes Knoll Inn, cross the Stone railway bridge (disused Dorset line) and take the first turning on the right into Norton lane next to the kiddies playground. Norton Lane will have a subtle name change into Maes Knoll Lane after the turning for Gibbet Lane, even though it's the same Lane. Cross over the Stone railway bridge (built 1877), At this point one should immediately look over to the fields to the left to see Wansdyke, which is seen as a distinct mound of earth. To the right of the lane are a line of trees and bushes marking the route of Wansdyke as it ascends the hill towards the southeast side of the fort. 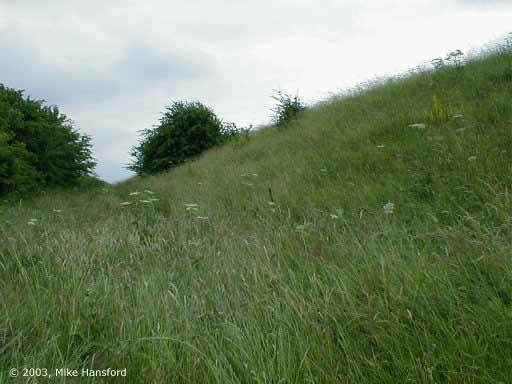 Wansdyke is a defensive barrier or border demarcation line built about 1500 years ago that stretched from here to the Savernake Forest in Wiltshire. Further along the road just past the turning for Norton Malreward there should be a sign for the public footpath that leads up to the fort, although this sign may well be shrouded in the foliage depending what time of year it is. It's worth pointing out that anyone who comes to see Maes knoll fort should really set aside some time to see the Stanton Drew stone circle complex which aren't to far from here. The climb up the hill to Maes Knoll on a hot day is quite arduous, but the views from the camp should make it all worth the effort. 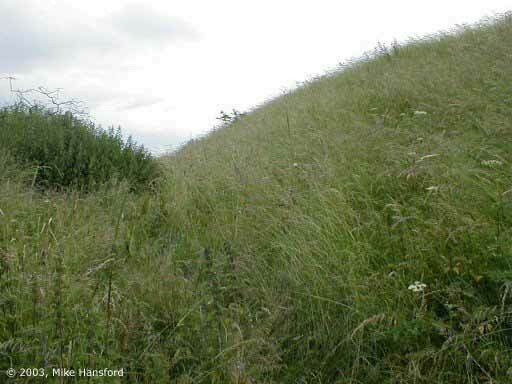 As one ascends the hill, Keeping close to the hedgerow on the pathway, one can see a ditch that should not be mistaken for Wansdyke. 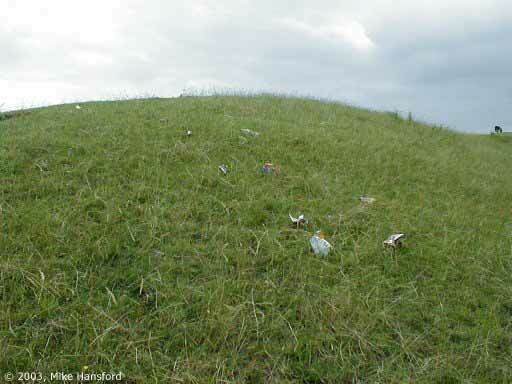 The rampart defences of the camp will be the first indicator that you made it up to the fort. Following the ramparts around to the left should bring you a clear view of the 'tump' that is sited on the western end of this 20 plus acre fort. On a good day you can also see Brunel's Clifton Suspension Bridge, new and old Suspension Bridges and the Welsh coast. 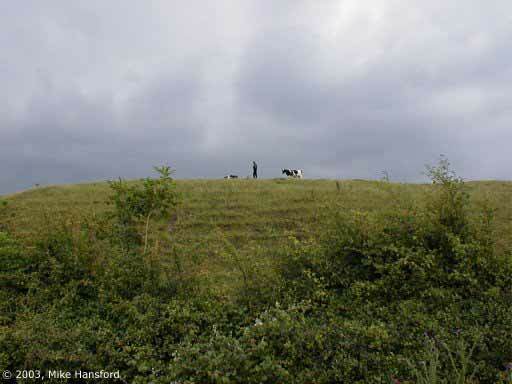 Another ancient defence or border marker that runs Southeast from the camp is Wansdyke.. Unfortunately there is no PRoW to the southeast of the camp to reach it. 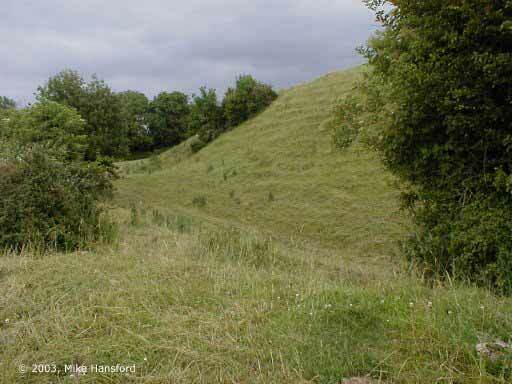 The Tump, the large Iron Age bank which closes off Maes Knoll to the west. Pictures shot during visits in the summer of 2003. Click here to enlarge. 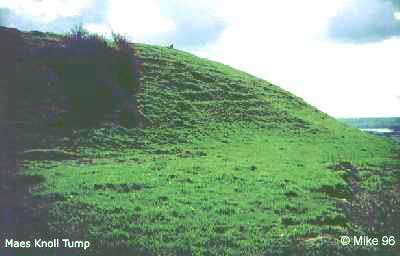 The 'tump' (click on both pictures for enlargements), as it's colloquially named, is a later feature of the camp and is part the great earthwork, Wansdyke, which some believe was its Western termination after it's long journey from Wiltshire. The massive scale of the 'tump' can be appreciated more so when one gets close. 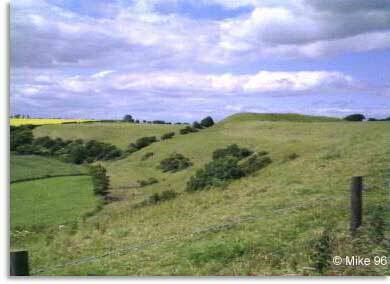 As previously mentioned, Wansdyke can be seen decending the hill over on the Southeast side of the fort. Unfortunately there is no PRoW to get across so depending on the time of year you go to the fort, you will either be hampered from getting over to that side of the fort because of crops or you may find that at other times the land is just being used as grazing for cattle, which I suppose wouldn't make too much difference as to walking over. But any time of the year one could probably walk around the perimeter of the fort to get there anyway. There isn't much to do on the fort itself except climb the 'tump' to relax while taking in the views. 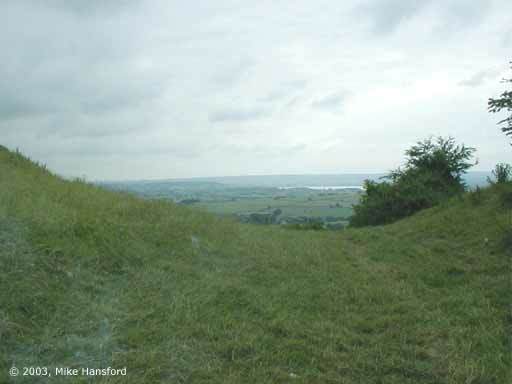 The views from Maes Knoll are fantastic, with Stantonbury Camp to the east-southeast in the far distance and Winsbury hill; site of a Ancient Britons/Anglo Saxon battle just to it's south. 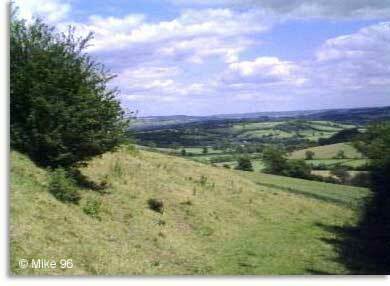 To the south you have views over the chew valley and the chew valley lakes. 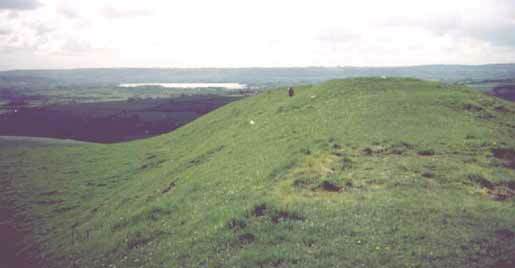 There would have been a Roman villa and Roman road in what is now the man- made lake and to the right of that there would have been a Romano-British Temple at Pagans hill. By far the best views, I think, are those you get looking north across Bristol. On a good day one can see Wales in the far distance joining England across the Severn estuary by both old and new suspension bridges, which are both easy to see from here. Brunels suspension bridge is also to be seen spanning the Avon Gorge. Close by to this bridge is Stokeleigh Iron Age camp on the left of the gorge and Clifton Iron Age camp on the righthand side of the gorge. It certainly makes one think about how life was for people of 2000 plus years ago? Sure, they would see the camp fires burning from other camps. Did they have much contact with other camps? Did they trade with them? On a street level, I've often wondered about Fortfield road in the Whitchurch suburbs of Bristol and how straight a road it was and because of that wondered whether it was a Roman road, particularly knowing that it joins a road called new fosseway!! I was contemplating what it would have been like a few millenium ago as to how people moved around to trade etc. From this, I couldn't but help think that Fortfield road in the Whitchurch suburbs of Bristol may have been a former Celtic/Roman trackway as it is very straight road for the three quarters of a mile of its lenght. I remember on numerous occasions being at the bottom of Fortfield road and thinking how it was that the road aligned itself up perfectly with the 'Tump' on Maes Knoll. Taking this further, If one extended the line of Fortfield road one finds that it points straight to Brislington Roman Villa, and extending the line even further it will point onto St Annes, holy well in St Anne's Park, St Anne's, along Wick road in Brislington. Coincidence? I know the Celts thought of water and wells with reverence, being the doorway to the underworld etc. Perhaps there was originally a Celtic trackway from St Annes holy well heading for Maes Knoll which may have later developed as a Roman track linking the villa at Brislington to the Lyons Court Farm area just below Maes Knoll and where two Roman stone coffins along with pottery where I believe were discovered. 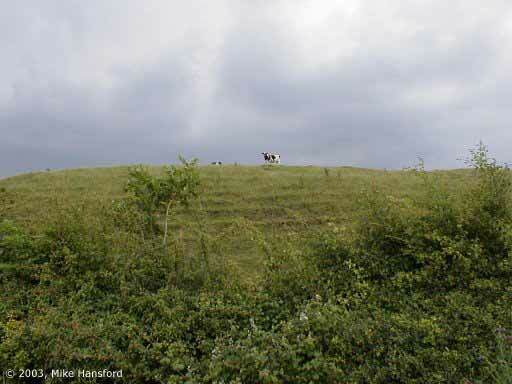 It has been suggested in the past that a Roman villa is believed to have been sited down off the slopes of Dundry near to Lyons Court Farm, but has yet to be discovered. Any 'route' from this villa to Brislington villa or the Holy well would take it across the present day Hengrove school playing fields and in particular the Imperial ground, the latter now being developed for housing. I can remember years ago several well trodden trackways in the fields surrounding the Imperial Ground, one or two of which are still there and some of which were built upon by the Asda supermarket at Callington road, Brislington. One of these trackways through the fields had an alignment to the stone bridge at the bottom of Jubilee Hill across the fields to the mini roundabout on Callington way i.e, in the direction of Maes knoll to Brislington Villa. One other alignment towards Maes knoll area seems to be the straight road that leads to what was one of the biggest villas in Britain, at Keynsham. This road is near to the ancient woodland of Illyngrove, Stockwood. I do know that a Roman Coin was found along this road. 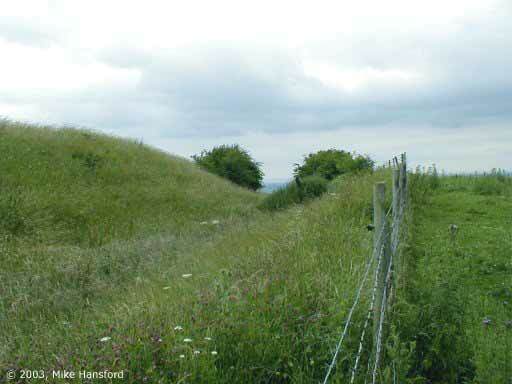 The consequence of all this would mean that if Fortfield road and the road in Stockwood were built on the course of a Roman trackway, then the 'tump' on Maes knoll would have been used to align the road, giving the 'tump' an earlier date than Wansdyke. All conjecture of course, but a nice few hours out nevertheless. Copyright � 1996, 2003, Mike Hansford. All rights reserved. Used with permission. 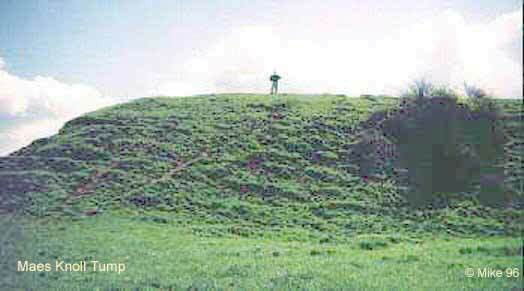 These pictures were taken in 1996 during a visit to Maes Knoll and East Wansdyke. Looking across the Tump to Bristol. Big sky at Maes Knoll..
Tump looking SW to the Chew Valley lakes. Another shot of the lakes in the distance. Maes Knoll defeces, the NE cicuit. In the ditch, looking south. Close to the spot where Wansdyke actually starts.